Most Southern Maryland residents will hire a hot water heater plumber for their water heater repair needs. We offer water heater repair services that will help you save money and possibly avoid the major cost of replacing your hot water heater. 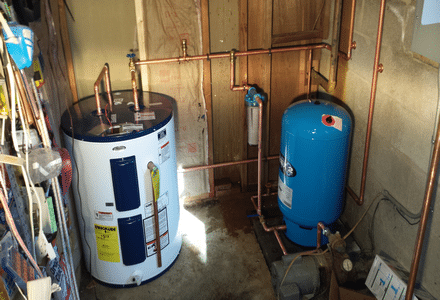 Traditional water heaters – Our most common water heater that uses a tank to heat and store hot water. Tradition water heaters can be heated using electric or gas such as propane or natural gas. Tank-less water heaters – designs that heat water as needed using a heat ex-changer that is designed to save energy and money. Tank-less water heaters can be heated using electric or gas such as propane or natural gas. Indirect water heaters – Use a boiler or furnace to heat fluid that is circulated through a storage tank’s heat ex-changer. We are one of the few plumbing companies in Lexington Park, MD that specializes in indirect water heaters. Each design offers different benefits to homeowners that can vary widely. As a result, be sure to contact us today to learn how we can help you choose a water heater for your home that suits your needs. Water heaters that show signs of leaks or potential leaks. Water heaters that have previously had issues with a thermostat, pilot light or circuit breaker.